These swords literally ooze coolness. Which is exactly what every warrior and lurking ninja needs when things get hot! Every now and then even the toughest of warriors and sneakiest of ninjas needs a break and some welcome refreshment – and what could be more refreshing on a sweltering day than a nice cold piece of frozen deliciousness? So make your warrior’s arsenal complete with a set of refreshing samurai sword ice lolly moulds. Fill them in advance with the wielder’s favourite beverage, stick them in the freezer, and when the action gets hot these frozen blades will be out there in a flash to cool things down and save the day. Just unsheathe these little ice blades from their plastic cases and restore your warrior’s energy to full strength for whatever action and adventure is coming up next! 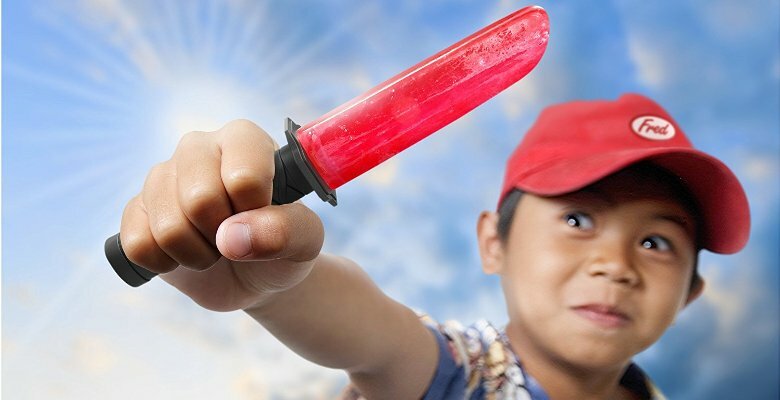 Two sets of ice moulds are included, and the ice lolly itself forms the blade part of the samurai sword, with a plastic sword handle providing a convenient grasping surface.